1 edition of My Patriarchal Memoirs found in the catalog. Add another edition? Are you sure you want to remove My Patriarchal Memoirs from your list? Published November 21, 2002 by Mayreni Publishing in Barrington RI, USA . This is the English-language edition of Zaven Der Yeghiayan's memoirs originally published in Cairo, Egypt in 1947. 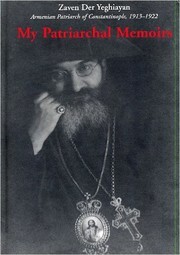 Der Yeghiayan was the Armenian Patriarch of Constantinople from 1913 to 1923. His memoirs cover the Young Turks' (Ittihadists) rise to power, their rule, and their criminal legacy of annihilation of the Armenian population in Ottoman Turkey. What makes this memoir so different from others is that Der Yeghiayan brings the reader behind-the-scenes into the intimate rooms of political intrigue that shaped one of the darkest decades in Armenian history. My Patriarchal Memoirs is the story of a man's fight for the salvation of his people against the overwhelming and conflicting interests of world powers. I. The Issue of "Abandoned Properties"
February 4, 2017 Edited by Todays Martyrs Reviewer Edited without comment. February 4, 2017 Created by Todays Martyrs Reviewer Added new book.